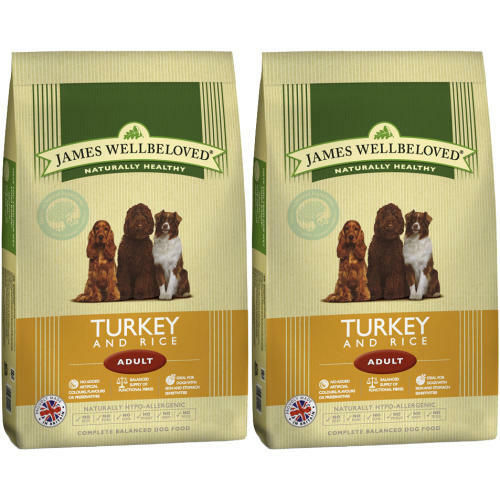 James Wellbeloved Turkey & Rice Adult Dog Food is a tasty recipe of turkey and rice, for all dogs, especially those with food allergies. James Wellbeloved is a unique dog food that's hypo-allergenic. With selected protein source turkey and selected carbohydrate sources of rice and oats, it is a dietetic food, excellent for the reduction of ingredient and nutrient intolerances. We suggest that the food be tried for a period of 3 to 8 weeks. If the signs of food intolerance disappear, continue feeding indefinitely.